When it comes to the packaging of your high-quality products, we don’t take any half measures: because cycle times, cavities, changeover times, and forming sets are just one side of the medal that we continuously optimize for you. Product infeed revolves around packaging products into blister packs. The most common way is by manually inserting the products; however, this usually reduces the overall performance of the packaging line because of the burden this places on operating personnel. Furthermore, this raises questions about the hygiene of the process, since the products are touched before packaging. Feed systems help solve this problem. They can also be integrated retrospectively into existing packaging machines – such as the semi-automatic version of the H105 infeed handling system or the fully automatic H106/H107 infeed handling system. But what happens to the finished blisters afterwards, as soon as the primary packaging process is complete? You can let your design imagination run free: add further design features such as labels or imprints to the front side of the blisters to turn your packaging into an eye-catcher at the point-of-sale that entices consumers to reach for your product. You can also immediately package the finished blister packs in secondary packaging such as cardboard boxes. 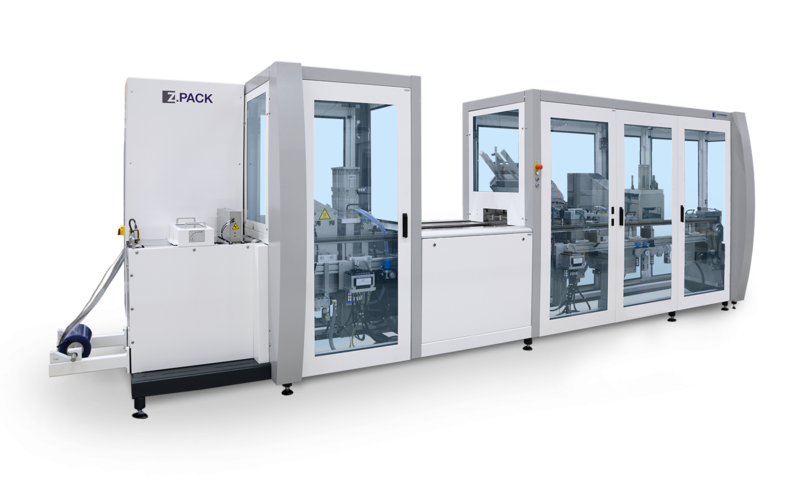 The Z.PACK can easily be integrated into fully automatic packaging lines in the “end-of-line” sector, of course, in accordance with the no-human-touch principle. We’ll gladly discuss further options with you.